Curious kids itching for real-life Indiana Jones-like intrigue will get swept away with the next book in this spine-tingling series about solving puzzles of the past--from whole civilizations that have vanished to mystifying monuments and urban legends. Fans of Night at the Museum and the Indiana Jones saga will be fascinated by these real-life mysteries: Is there any truth to the legend of Bigfoot? Why have planes and ships suddenly disappeared in the Bermuda Triangle? Is there really a lost city of gold in the jungle of Central America? The next book in this exciting new series will cover even more of history's most fascinating head-scratching conundrums, including the curse of the Hope Diamond, King Tut's tomb, black holes, the puzzling disappearance of ancient civilizations, cryptic creatures of myth and legend, long-lost treasure, and so much more. 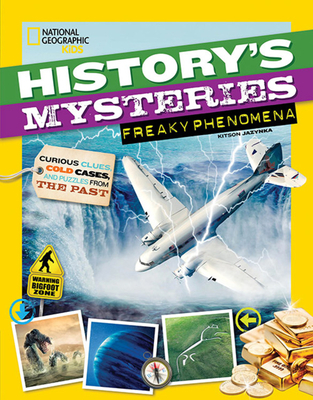 Kids can dig into these mysteries, uncover clues, and ponder leading scientific theories to help decipher what really happened. Chock-full of cool photos, fun facts, and spooky fun, this book is sure to keep curious kids engaged as they try to piece together these puzzles of the past! KITSON JAZYNKA is an award-winning freelance writer and children's author based in Washington, D.C. Jazynka contributes to National Geographic Kids, American Girl, Horse Illustrated, and the Washington Post, among other publications, and has written several books for National Geographic Kids.